Portland-Vancouver Metro: Light rail vs. Buses | Audio and video stories from Southwest Washington. 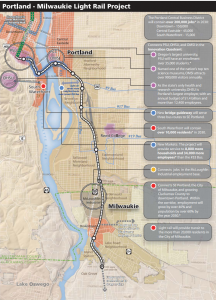 May 2012 the U.S. Department of Transportation awarded Portland’s regional mass transit agency $85 million to help complete the Milwaukie light rail to nowhere project, which could actually make current transit riders in that corridor demonstrably worse off. When it is all said in done, the $1.5 billion cost for the Orange Line will eliminate the more efficient express buses and add to commuter time with fewer downtown destination points. 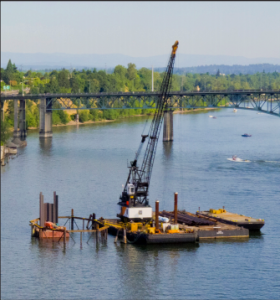 Contentiousness around financing and whether there was a pressing need for the 7.3 mile, $205 million per mile ($1.5 billion) Portland-Milwaukie Light Rail Orange Line, spurred the recently approved Clackamas County rail initiative measure 3-401. With its passage, it will now require countrywide voter approval before officials can spend money to finance, design, construct or operate any rail lines in the county. Though Clackamas county commissioners and TriMet officials have said this initiative applies only to future projects, it’s still unclear how the county will come up with the funds for the legally binding $25 million contract commitment for the Orange Line. Well before the federal transit funds pushed this project forward, the Cascade Insider assembled a lighthearted but factually poignant video, The $1.5 Billion Milwaukie Light Rail Alternative, illustrating the enormous benefits for transit riders if $1.5 billion was invested in high-end buses. Having experienced the federally funded and unstoppable light rail agenda spreading its expensive slow rail tentacles across the region, Clackamas County finally acted and reclaimed the right for voters to have a say in these transit issues. Proposition 1 asks for an increase in sales tax for the operation and maintenance of the light rail exension to Clark College. Contrary to what others say, the vote is a referendum on light rail and may be the only chance voters have to weigh in on whether they want light rail. A “no” vote would send a clear message to keep light rail out of Vancouver. ** The revenue from the sales tax increase would also be used for a proposed bus rapid transit line on Vancouver’s Fourth Plain corridor. The Washington Policy Center’s Citizen’s Guide to Clark County Proposition 1 discusses some of the ramifications of light rail and the referendum vote. C-Tran leaders and others do not see the measure as a referendum, characterizing it as nothing more than a funding question. **The Independent Review Panel Final Report from July 2010 (pgs. 145-146) under C-TRAN’s Operations and Maintenance Costs it states, “The agency has agreed in principle that it will fund the operations and maintenance O&M costs of the new LRT system after it is built. However, it must first get approval of the voters in their service area to do so. A proposed ballot initiative has been suggested at the earliest for the spring of 2011. Expressed support for this initiative is said to be 50/50. In addition, currently a petition drive is underway in the C-TRAN service area that would prohibit LRT from being brought to Clark County. The outcome of the public process underway will impact whether or not funding is available to pay for the O&M portion of the LRT system proposed as part of the CRC. Recommendation related. The IRP sees that light rail transit is an essential component of the successful CRC. Therefore, if one or more of the concerns listed above prevent LRT from being included in the project then the consequences are significant and will probably result in substantial delays or no project at all.